SO EASY TO SET UP AND OPERATE, ANYONE CAN DO IT. ROLLER BOY FROM YAMAYO.......... A MORE ACCURATE, MORE AFFORDABLE PRECISION MEASURING WHEELS. Recreation events, School use materials, Gardening & golf-course layouts, Gas & water piping, Rail track, Lumbering, Pipeline and more!!! Grip easy to handle and Arrow-headed plate for zero setting. Easy to set up and can operate by one person. Precision 5 digit large counter (housed in sturdy ABS case) to read out easily. 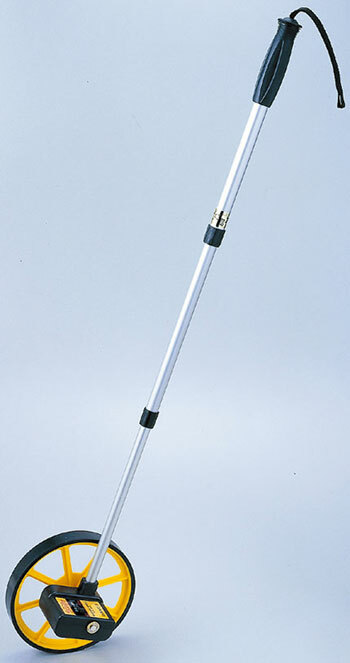 Adjustable telescopic aluminum handle to your comfortable level by twisting, pulling up and pushing down. Arrow-headed plate for zero setting. 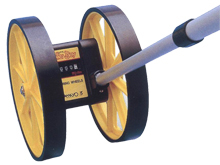 Wide tire (28mm) used for stable measurement. Tire made of heatproof and durable rubber. Less wobbly wheel as the axle fixed at 2 points in the case. To keep the unit good condition, remove mud or sand after use. 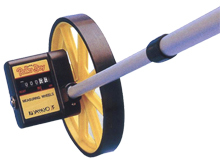 Do not use in the rain or in the muddy places for MODEL RB20S1/RB20D1. Walk at slow pace when measuring for MODEL RB20S1/RB20D1, otherwise fast walk will exceed the limit of the counter's measuring ability.